Welcome…I hope your day is going great, that the sun is shining and that it’s strawberry season where you are! If not you can file this recipe away on a Pinterest board but I hope you can find some strawberries and try out these sour cream shortcake biscuits. They are easy, quick and look beautiful. This recipe is from a favorite cookbook called The Herbfarm Cookbook by Jerry Traunfeld. Once mixed, the dough looks very shaggy. I have found it works best to bake it as a slab on a cookie sheet. I’m all for quick and easy. 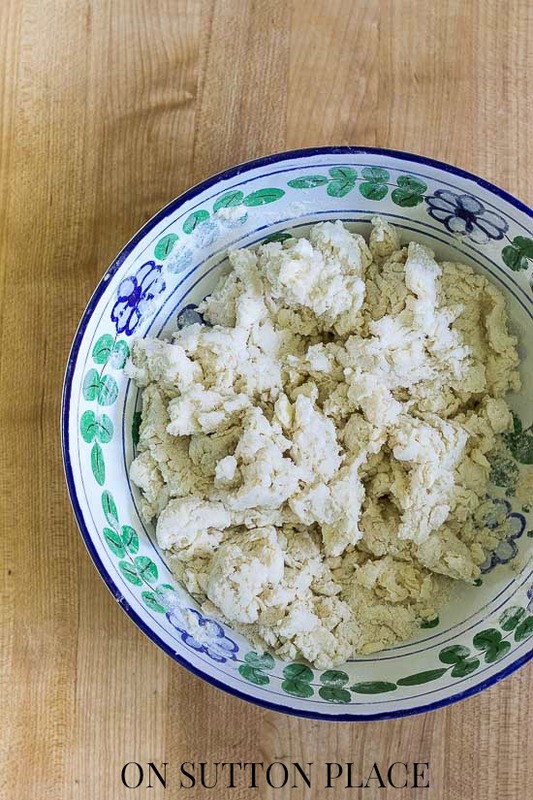 In a large bowl place the flour, baking powder, baking soda, salt and sugar. Whisk to combine. Cut in the butter with a pastry blender. Stir in the sour cream and milk. Dough will be shaggy. Put out onto cookie sheet and spread to about 1 inch thick. Sprinkle with sugar and bake for 12 - 15 min. Watch closely at the end. Should be lightly browned around the edges when done. Cool slightly. 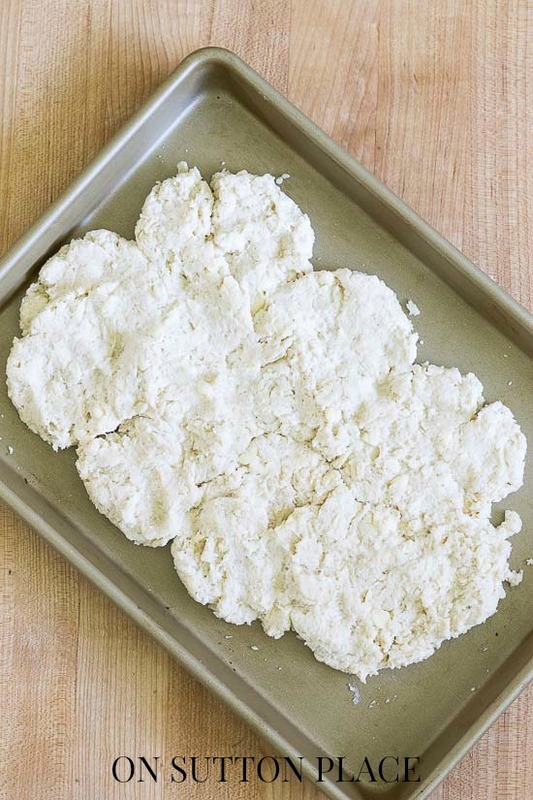 Cut into biscuits and serve with fresh strawberries. I used a 2 1/2 in. round biscuit cutter but you could make them any size or shape. 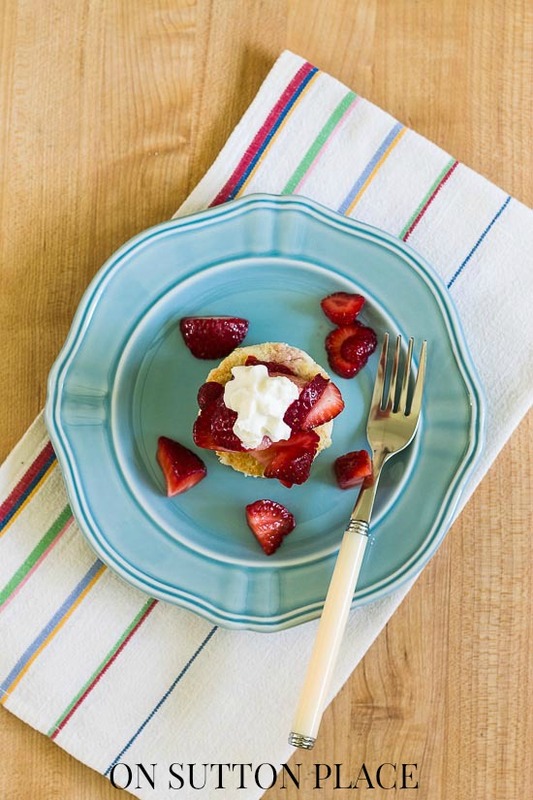 For a more rustic dessert, just break the shortcake into pieces and place in serving bowls. Top with fresh strawberries and whipped cream. I let the baked shortcake cool just a bit before cutting out the biscuits. I usually get about 8 biscuits when I use a 2 1/2 in. round biscuit cutter. 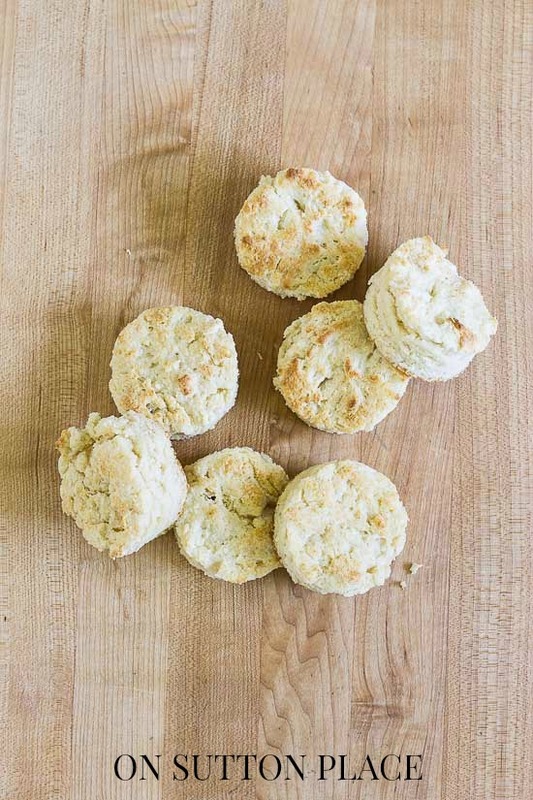 One of the best things about this recipe is snacking on the left-over pieces of shortcake after the biscuits are cut. I put them in a ziploc bag and eat them for breakfast! 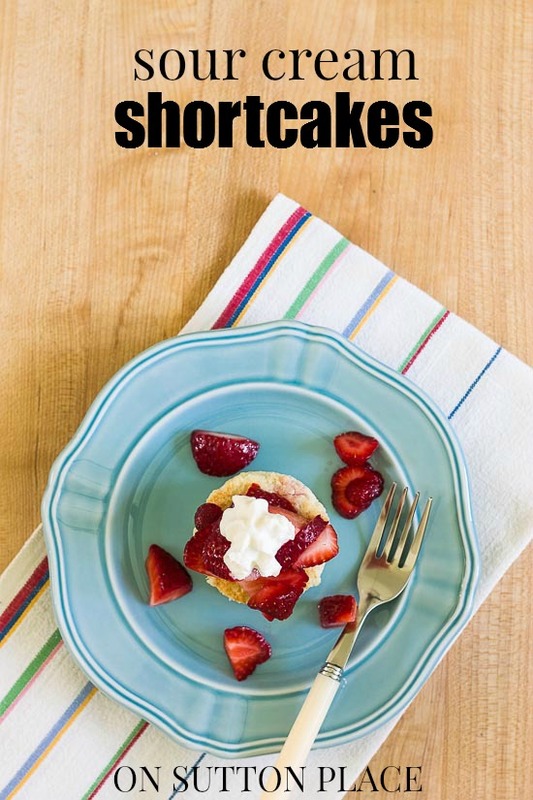 As I said in the recipe, you can also break up the shortcake right into your serving bowls. It’s a more rustic presentation but equally as good. This time of year is always full of “firsts.” The first batch of fresh strawberries, the first time to fire up the grill, the first evening spent relaxing on the porch. After the winter we had, I am so thankful for all of these firsts. I hope to plant my container herb garden this weekend and replace a few things that didn’t survive the winter. I had some mature boxwood out front that fell victim to the mounds of snow that sat on them for months. I’m trying not to pout and looking at it as an opportunity to plant something new. No idea what that is but I will let you know! I’ll be back on Sunday with my No Sew group. See you then! This looks so good. 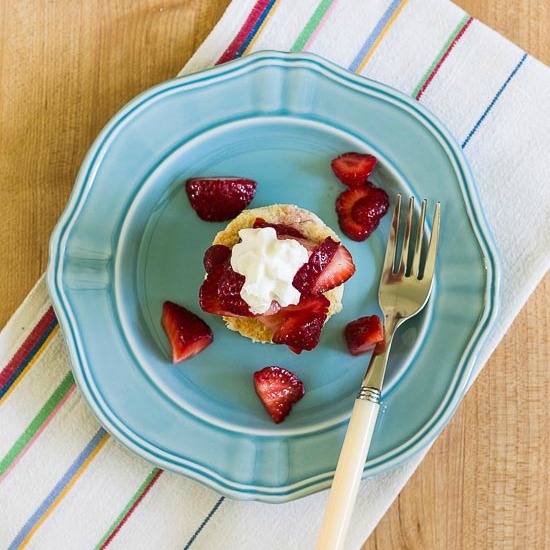 With strawberry season fast approaching, it is so nice to have a quick and easy recipe on hand! Looks fantastic Ann….Have a wonderful weekend and Happy Mother’s Day!!! Thanks for mentioning the book, Ann. I am also a huge fan of cooking with fresh herbs. I always have parsley, cilantro and dill in the fridge. They make a big difference. I am going to try growing my own this summer. Good morning from the Chicago area! have I told you lately how much I love your blog ? You are truly an inspitation! I can’t wait to try this this weekend! Do you mind if I share it on my blog? I mention you every so often so my followers are getting to know you a little. Thank you! I can’t wait to try out this recipe as I just bought some raspberries. And these shortcake biscuits look far better than the ones I use to make! Ann, I adore strawberry shortcake! I’ll definitely be trying them… anything with sour cream in it is my cup of tea!!! It’s 90 degrees here in the Raleigh, NC area……so I won’t be baking anything. Actually planning on cold chicken, etc. for dinner. The recipe looks pretty easy, so I’ll pin it and save it for a cooler day. Always good to hear from you with great ideas. Hey, I am Carol from Raleigh too!! Small world….and yes, the 90 degree heat here is a bit much today! But my hubby just walked in the door with strawberries from Vollmer Farms so I am giving in and baking these little shortcake babies for a special treat..and planning a special breakfast treat like Ann suggested with the odd pieces! I just weeded my strawberry patch this morning, no strawberries yet but nice green plants. I will give your recipe a try once they start coming on. Ann, to celebrate our first day of 80 degrees here in Ohio, I am preparing your recipe and loading my bowl with strawberries and lots of whipped cream. Yes, winter took its toll on my For-get-me-nots. I will be adding new plants. I am pleased my Bleeding Hearts plant is doing well.